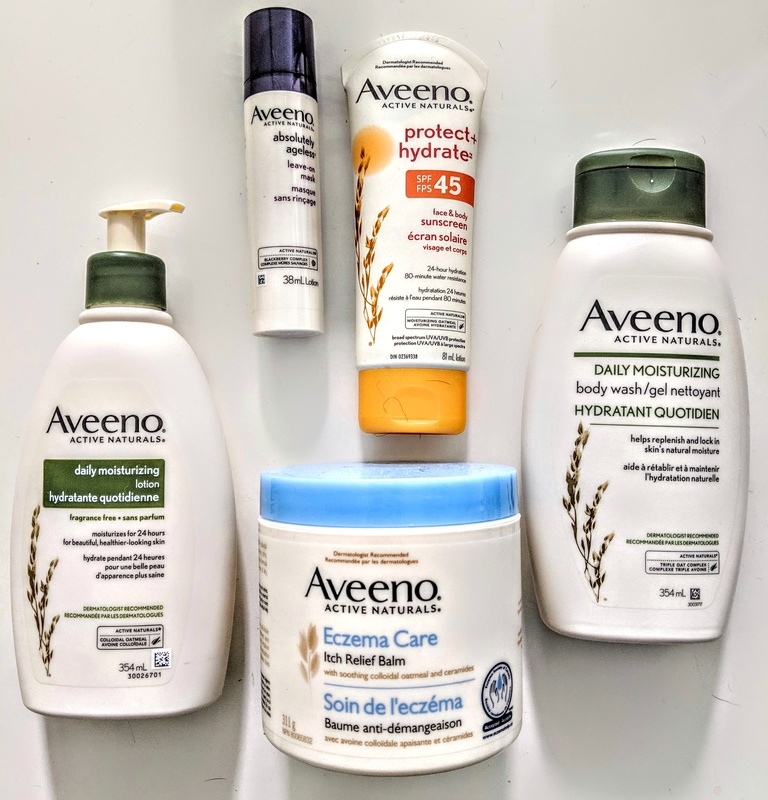 If you’ve been following me for awhile (or have seen my IG Stories of the beauty products I travel with), you know that I’m a longtime fan of Aveeno products (and I was a brand ambassador with Aveeno for a number of years). So in the spirit of sharing great products with this season, I couldn’t not include one Aveeno giveaway! The prize is valued at $100 and I made sure to include a few of my personal faves and a few others I think you’ll enjoy trying out if you haven’t already. AVEENO® ABSOLUTELY AGELESS® Leave-On Mask. This light formula helps fight environmental factors and signs of aging. And leave-on works for me (anything to reduce steps in my beauty routine!). AVEENO® DAILY MOISTURIZING Body Wash. I shower a lot (twice a day on days i have an event to attend and a workout) and this body wash has colloidal oatmeal and natural oils that leaves skin looking and feeling great. AVEENO® DAILY MOISTURIZING Lotion. I use this daily in the summer on the evenings I shower in the evening. It’s not greasy plus it moisturizes for 24 hours. AVEENO® Eczema Care Anti-Itch Relief Balm. A go-to in the winter or any day of the year when my skin is feeling especially dry. It provides more intense hydration than the Daily Moisturizing Lotion. AVEENO® POSITIVELY RADIANT® Make-up Removing Wipes (not pictured above). Out of all the Aveeno products I use, this is the one I use most often. Great for after a workout to wipe off sweat or to clean off makeup on nights I’m feeling really tired, which is often when I’m traveling, or as a pre-cleanse before washing my face with a cleanser and rinsing, these wipes have moisture-rich soy extract and I like the product’s delicate fresh scent. AVEENO® PROTECT + HYDRATE™ Sunscreen Lotion SPF 45. Another Aveeno staple from my travel kit, as it’s under 100mL and slathers on nicely without feeling greasy. Check out my Instagram post for this Aveeno giveaway and enter on Instagram (details are on the IG post). Get an additional entry by commenting on this blog post and sharing which of the products above you love (or want to try out) most. This giveaway ends at 11:59 p.m. EST on Tuesday, March 26, 2019. It is open to Canadian residents, excluding Quebec. The winner will be chosen at random and announced on my Instagram Stories on Wednesday, March 27, 2019. The prize is awarded as is. The winner will be asked to fill out a release form to claim their prize. I am operating this giveaway on my own and it is not associated with Instagram. If there are two things I do a lot of it is travelling and blow-drying my hair. My work calls for me to go out of town a fair bit (even though I am cutting back on it as I know I need more time at home), and as for the blow-drying, since I work out regularly and sweat a lot, I’m frequently showering twice a day (to get ready for the day and then again post-workout), and that often calls for blow drying twice a day. 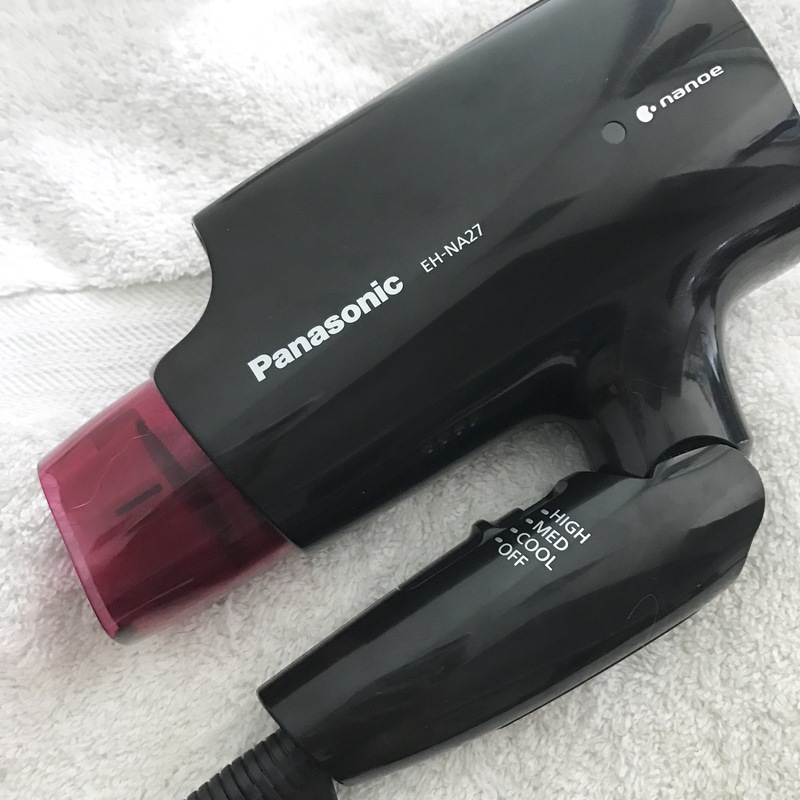 You’re probably wondering why I’m talking about these two things as going hand in hand, and that’s because I’ve been testing out the brand-new Panasonic Nanoe™ Compact Travel Hair Dryer, and this little addition to my beauty toolkit has helped me out with both my time on the road and at home. I never used to travel with a hair dryer and never really understood the point of travel hair dryers–after all, don’t all accommodations have a hair dryer in the room? But now having traveled regularly for the past six years and having been forced to use the often terrible ones at hotels (you’d be surprised at how many places still offer the old-fashioned weak ones that are attached to the wall and look like a Flowbee) I’ve paid for it with bad-hair days. This is why I’m now making room in my carry-on for the Panasonic Nanoe Compact Travel Hair Dryer. It’s not a big deal to bring it along, since it’s so compact thanks to being foldable. So now I can rest assured I have the right tool for the job when I’m away from home. 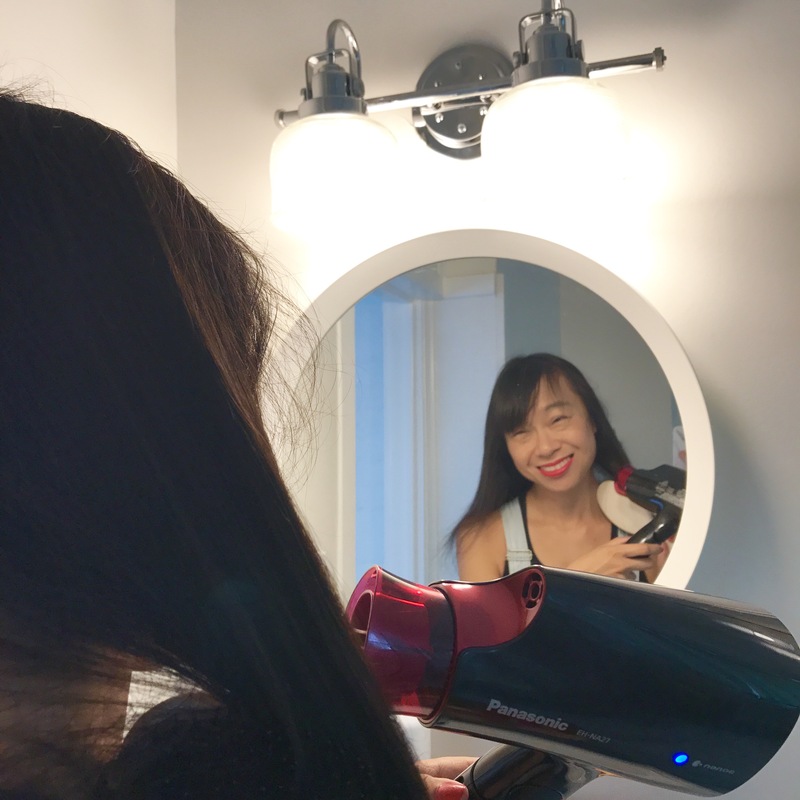 This powerful 1,400-watt hair dryer is lightweight, and its Nanoe™ technology helps minimize damage from brushing (which is helpful since I find my hair can often feel dry and damaged, I think because of all the shampooing and heat I expose it to). The proprietary Nanoe™ technology draws water from the air to fortify hair with moisture-rich particles that reduce the damage caused by everyday brushing, leaving hair smoother and shinier. Since using this dryer, I’ve noticed my hair is a little more brilliant and less parched. It has so many other great features going for it, I often reach for it first even at home instead of my non-travel/usual hairdryer. It comes with a quick-dry nozzle that puts out both strong and soft airflows so you can get the job done faster–and if you know me at all, you know very well how I’m often rushing last minute to get out of the house, so I can definitely use any tool that helps me get ready quicker. If I’m on time for events or meeting with friends, well, that’s thanks to precious time saved with this impressive little hair dryer. I can’t quite say I’ve come to love the routine task of blow-drying , but it’s definitely less of a chore, and you always feel more confident when heading out the door on a good-hair day, am I right? 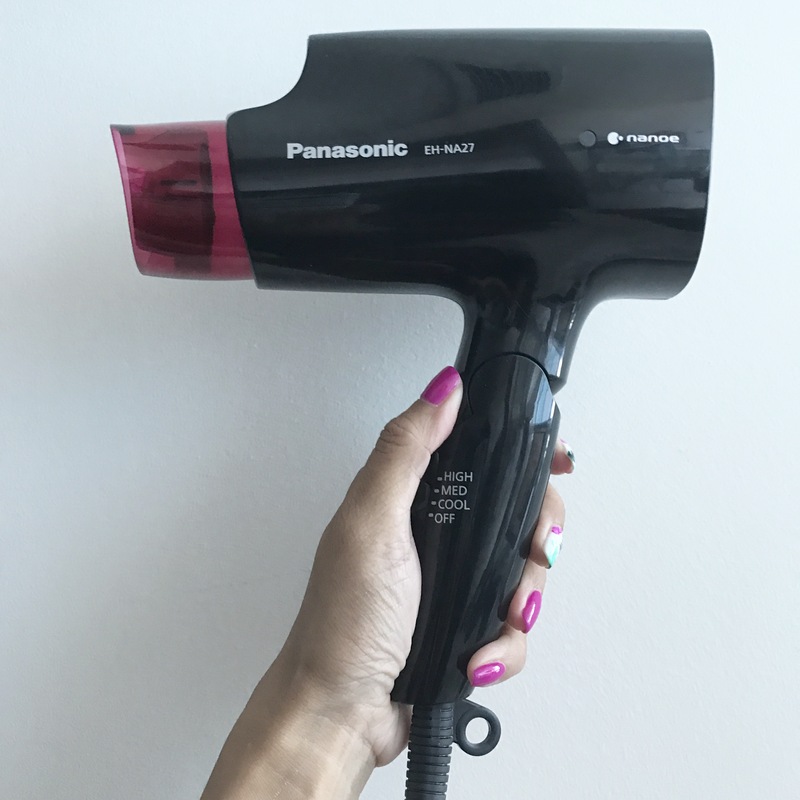 The Panasonic Nanoe™ Compact Hair Dryer has an MSRP of $99.99 and is available at T&T Supermarket locations and at Panasonic.com. Sometimes my schedule can feel overwhelming. I’ve been traveling more than ever, and while it’s exciting and fun, it can also bring about stress. The lack of routine, while it suits me, at the same time also drives me bonkers. But ultimately my love for discovering new places, new flavours and having new experiences is what keeps me going. What else keeps me going and helps bring some balance is a healthy routine, no matter where I may find myself in the world. My adventures may have me rappelling down a waterfall (like I did this month in Puerto Rico) or surfing with a friend in Barbados or in California, but my beauty regimen is a comforting constant in my life. 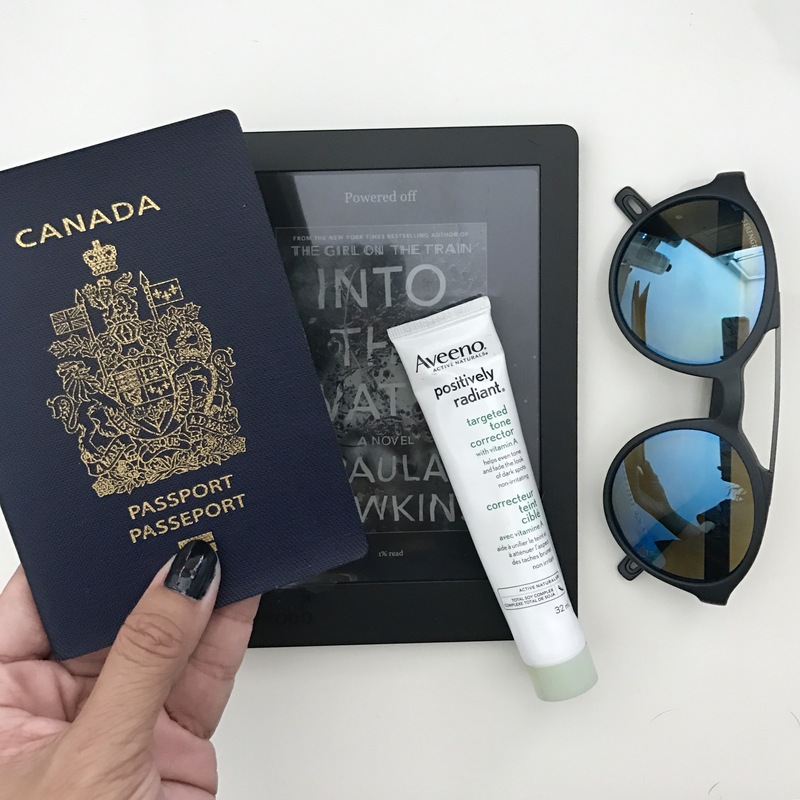 And there are a few items I never leave home without, including my Aveeno® faves (I am an Aveeno® ambassador, after all, and use their products regularly because I know I can rely on them). My absolute essential, if I had to name my one Aveeno® must-have, is the Aveeno® Positively Radiant® Make-Up Removing Wipes. When I have the energy to, I’ll use them as a way to preliminarily remove makeup, oil and dirt from my days exploring a new town, and also wash my face with a cleanser, but to be honest, most nights when I’m traveling for work, I get back to my room quite late and I am ready to fall into bed immediately, so these wipes are a quick way to remove all of the makeup and grime before I crash. There are many times I’m tempted to skip this step, but then I hear in my head every derm and makeup artist I’ve ever interviewed telling me that cleansing before bed is crucial, and I remember that I don’t want clogged pores and breakouts and so I break out one of these Aveeno® wipes and I’m done and under the covers of the plush hotel bed in no time flat. (I also count on these wipes after running a race; so great for cleaning off all of the sweat after a marathon!). The wipes have a pleasant but not overpowering fresh scent, and the packaging helps keep them from drying out (I’ve tried other brands that dry out pretty quickly, but these stay juicy with its natural soy extract formula). Now, I know I just said the Positively Radiant Make-Up Removing Wipes are my #1, but how about we call it a tie? 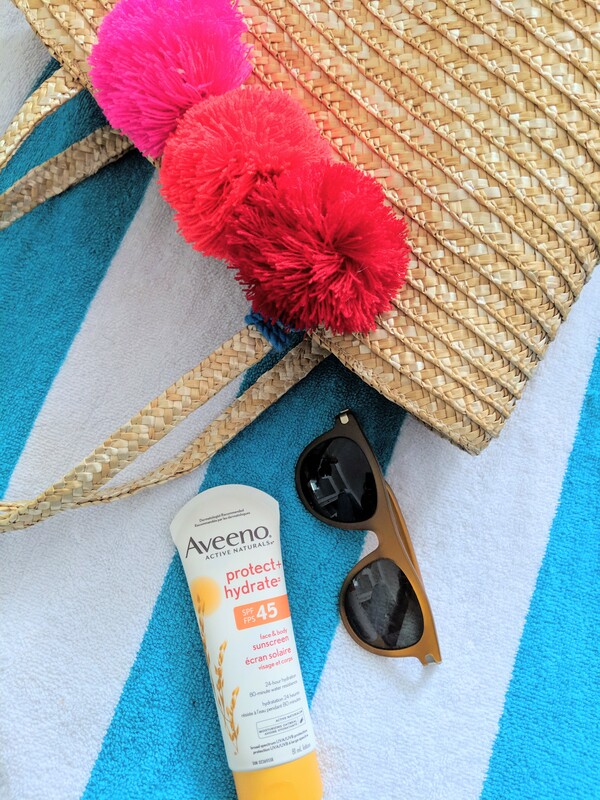 Because no matter where my travels take me, I need to have my Aveeno® Protect + Hydrate™ Suncreen Lotion SPF 45. I wear sunscreen every day, no matter what season it is (in the winter, I will switch to a regular moisturizer for my body since it’s all covered up by layers, but SPF on my face is part of my everyday routine). This SPF 45 lotion is my travel sunscreen go-to for many reasons: it comes in a 81-mL tube, so I can toss it into my carry-on luggage as it meets the TSA liquid requirements; it smooths on easily and absorbs quickly, which is important because I often don’t have a ton of time to get ready in the mornings when I’m traveling so I have to be really efficient with my time; and lastly, I can use it both on my face and my body (so I don’t have to pack two different products). Last but not least is a product that’s a new addition to my product lineup: Aveeno® Positively Radiant® Targeted Tone Corrector. Despite my diligent use of sunscreen, I can still get some dark spots, and evening my skin tone with a product that’s not irritating to my skin is a priority. This Targeted Tone Corrector has vitamin A, to help fade those freckles, while also helping with blotchiness and dullness. So, it helps me look radiant, even if I may not be feeling so radiant due to jet lag. And I am pretty much in a constant state of jet lag (and also oftentimes if not jet lag then poor sleep habits, which can make my skin less than glowing too). What are my other never-leave-home withouts, which I recommend you travel with besides these beauty products? A swimsuit (even if there’s no pool where you’re staying, there may be a hot tub at a spa you go to, or on your balcony, and you wouldn’t want to miss out on using that, would you? ), flip flops (they’re easy to slip on if you need to step out quickly to grab breakfast in the hotel, for example), leather moto jacket (which can easily be worn no matter if your outfit is more dressy or casual and it’ll keep you just warm enough in locales such as in the Caribbean where it can get a bit breezy at night) and a travel adapter (one with at least a few USB ports, too, so you can charge multiple devices easily, which is helpful when your hotel room just has one hard-to-reach outlet). Travel adventures and living life on the go simply becomes much easier when you have things like these essentials to count on keeping you on a healthy track. Because there are enough other variables to juggle with–a foreign language, flight delays, limited wifi, you name it–when out exploring and away from the comforts of home!